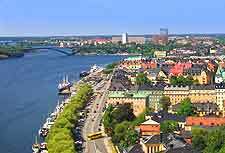 Comprising a series of islands and located on the eastern coast, Stockholm is the capital city of Sweden and remains one of the world's most beautiful and appealing cities. Home to many picture-postcard scenes and endless buildings in shades of terracotta, Stockholm's skyline shimmers in the waters of Lake Mälaren and enjoys rich, blue summer skies, whilst in the winter, the city is covered is crisp snow and scattered with lights. 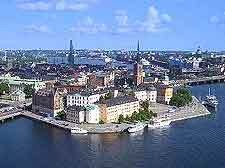 Stockholm has become an extremely modern city and known for its cutting-edge designs, fashion and exceptional nightlife, although the city has managed to preserve its roots within the Old Town area known as the Gamla Stan, where you can quite easily lose yourself in history. This labyrinth of winding cobbled streets is based around the Stortorget (Big Square), while lying to the south and on a further island, the Södermalm offers a definite bohemian vibe, many art galleries and historic residences, and a sumptuous waterfront lined with hills. To the north of the Gamla Stan is the very centre of Stockholm and the Norrmalm district, and this is where you will find the Hotellcentralen, one of the city's main tourist information centres, offering both tourism advice and a useful accommodation booking service. Also extremely close by and in the Drottninggatan area is the Stockholm Visitors Board, which is also a good source of information and a good place to get your copy of the free monthly 'What's On' magazine. Like many capitals in Northern Europe, Stockholm can be an expensive travel destination, but a trip to this lively cosmopolitan city can still be affordable. Check out budget accommodation options and free attractions before you head off to find great value, although budget travellers are advised to book Stockholm hostels in advance during peak seasons, as the best spots can fill up fast. Try exploring the city by taking an afternoon boat trip along its numerous waterways or around Lake Malar, and see if Stockholm really lives up to its slogan of 'Beauty on Water'. Alternatively, there are roller coasters at the popular Tivoli Gröna Lund amusement park, along with many other fast rides, and regular rock concerts, playing to audiences of thousands. The glass tunnel at the Aquaria Vattenmuseum is the best way to observe their sharks and marine attractions, while close by the Katarinahissen (Katarina Lift) always seems to draw in the crowds, elevating passengers to its high observation deck. More information about Stockholm Tourist Attractions. As the Swedish capital, Stockholm contains many of the country's most important buildings and finest architecture. None come more impressive than the romantic Drottningholms Slott (Drottningholm Palace), where its rather unusual Chinese Pavilion is deemed to be so important that it helped the palace become listed as a World Heritage Site in 1991. 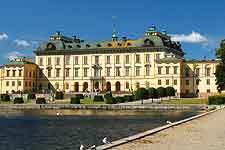 The Stockholms Slott (Stockholm Royal Palace) is another magnificent building, and the official home of Sweden's royal family. Look out too for the Riddarhuset (House of Lords), and also the majestic Stadshuset (City Hall), which attractions around half a million visitors each year. More information about Stockholm Landmarks. Tourists should also consider taking a cycle around the island of Djurgarden, where the highly acclaimed open-air museum of Skansen resides. Founded in 1991, the information and exhibits at the Stockholm Skansen Museum allows you to understand how Swedes once lived, many years ago, and is also home to a zoo with numerous Scandinavian animals. The national collection of antiquities at the Historiska Muséet is quite enthralling and actually covers around 10,000 years worth of fascinating Swedish history. 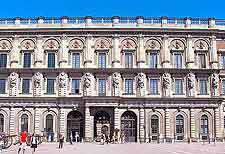 Stockholm's National Museum of Fine Arts is worthy of some time and this is the biggest art museum in Sweden, housing the national collection of paintings. 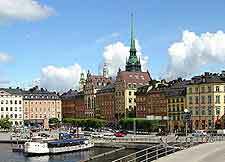 More information about Stockholm Museums and Stockholm Art Galleries. Many visitors choose to spend a day or two around Stockholm's beautiful archipelago, or even venture further outside of the city. The town of Birka is close by and famed for its enormous Viking cemetery, although if it is sandy beaches that you crave, head to the island of Sandön, where an attractive quayside awaits. Also close to Stockholm is the lakeside village of Mariefred, the historic town of Sigtuna, and the Tyresta National Park, where many winding hiking trails pass scenic areas of extreme natural beauty. 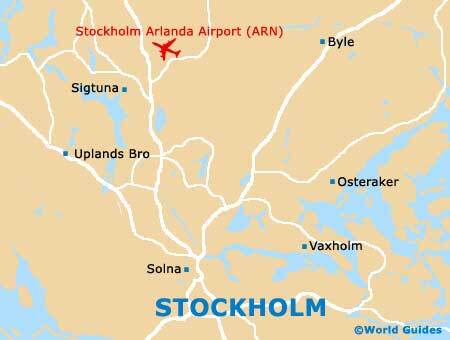 More information about Stockholm Attractions Nearby.